3-D Planets in a Tube presents a fun way for children to experience the wonders of the Solar System in their own bedroom. 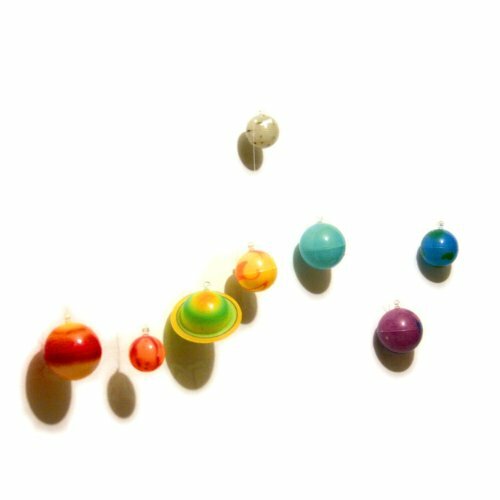 It includes 8 miniature glow-in-the-dark planets (plus Pluto), adhesive putty and over 7.5 metres of string to hang them from the ceiling. The brightly coloured planets look beautiful in the light and glow radiantly at night time. Different colours, patterns and sizes will help children learn to identify each planet and have fun putting them in the right order: Mercury, Venus, Earth, Mars, Jupiter, Saturn, Uranus, Neptune then Pluto. 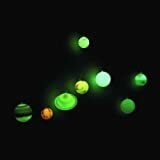 University Games Great Explorations range of glow-in-the-dark planets and stars has been a worldwide market leader for over a decade, helping children discover the wonders of outer space. All of our glow-in-the-dark products are of the highest quality and come with a lifetime glow guarantee. Just expose them to light and they will recharge again and again.